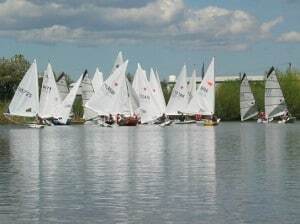 Swarkestone SC hosted this years Northern Tripartite race series. Five ASC members took their boats along, Keith Brereton and Kevin Milton with their Phantoms, Roger Day and Kevin Last with Supernova and Paul Jago took his Streaker. The wind was blowing from the south west which is the worse direction for the lake at Swakeston as it blocked by a large bank and trees. This causes the wind to gust down the back of the bank and through the gaps in the trees. The course saw a close reach start and far from ideal beat along the length of the lake followed by a very broad reach back again. Race 1 saw Tim Hand get well away from the fleet and was never challenged. Roger Day started in fifth but managed to climb through the fleet helped in part by other boats capsizing, to cross the finish line second but beaten by John Hainsworth (Laser)of Swarkeston and Paul Jago on handicap. Race 2 and the wind had increased if anything such that most of us were overpowered and there were a significant number of capsizes. One having a large impact on the ASC challenge. Keith Brereton broke his mast giving him a DNF and of corse a DNC in race 3. Tim Hand once again got awayand the ASC boats did not have such a successful race. Paul was 4th, Roger 8th, Kevin Last 9th and Kev Milton 10th. With no chance of winning the reamining four ASC boats took to the water. The OOD took pity on the crews and limited the race to a maximum of three laps. Kevin Last made an error and tried to sail over a sucken island and Kevin Milton went for a swim. The handicap results thus saw Paul in 6th, Roger in 9th, Kevin Last 10th and Kevin Milton 12th. Tim Hand once again took line and handicap honours. So with 188 points we came last. But with 27 boats on the water Paul was 4th overall, Roger 6th and first senior, Kevin Last 9th and Kevin Milton 10th. Understandable Kevin Brereton was equal 25th. An enjoyable but tiring day.